Hello: Happy weekend. I learned about competition by reading…of all things…my own eNewsletter “Musers!” You can find each day’s copy in the News tab on this website. Meanwhile back at the community where you live…I do hope you will consider this contest to boast about how wonderful your community is. Across America and around the world, communities are working to make their streets, neighborhoods, parks, homes, and businesses more accessible, more welcoming, more age-friendly. An age-friendly community is a great place to grow up and grow old. These efforts help older adults stay healthy and active, connected to their communities, and safe and independent in their own homes for as long as possible. 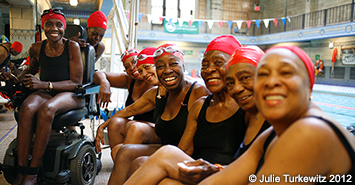 The FRIENDLY PLACES, FRIENDLY FACES photo contest from Grantmakers In Aging’s Community AGEnda initiative seeks pictures that capture that feeling of age-friendliness. What does it mean to you? How does your photo tell this story? A winning photo could capture a great moment between a grandparent and a grandchild, an older person walking in the neighborhood they love, or people of different ages working together to make their community better. We’d like to hear the story behind the photo, too! When you submit your photos, please include a caption describing who’s included, what’s going on, and where the photo was taken. A panel of expert judges will select three winning photos from each category below. Winners will split $6500 in cash prizes! Older and active: Featuring older adults involved in sports, exercise, recreation, health promotion activities, and more. No place like home: Featuring seniors living in their own homes, or housing that is affordable and accessible for seniors. On the road: Featuring roadways, crosswalks, sidewalks, and other places safe and pleasant to walk, bike, or even use a wheelchair; public transit that welcomes and accommodates older adults. Parks and neighborhoods: Featuring any neighborhood or local feature that makes a neighborhood a great place to grow up and grow old. In the mix: Featuring seniors staying involved in their communities, still contributing by working or volunteering; or older people being included in activities in creative or unexpected ways. Take your best shot: Your very best age-friendly image of any kind. Contestants may enter up to five photos. Your entries can be distributed across the categories in whatever way is appropriate given the content of the photos – all five photos in one category, two photos in one category and three in another, etc. Confirm that you have or can obtain a signed model release for any photo you plan to submit. If you don’t have your own model release form, you may use GIA’s model release. Complete the online entry form below. If you are submitting multiple photos, complete a separate form for each photo. Questions? Email us at mjones@aboutscp.com. I have read the Official Contest Rules. I am at least 18 years old and eligible to enter. This photo is my original work, and I own the rights to it. I have or can obtain a signed model release from all recognizable subjects in this photo. Participation in this promotion is subject to the Official Rules.